Why do we love the superhuman? As our month of talking excitedly about superheroes winds to a close, I just want to take a moment to ask a final, simple question – what is it that attracts us to these stories, to the idea of the superhero? The success of The Avengers and the other Marvel films tells us that there is something engaging here; the fact that people tattoo their bodies with Superman and Batman symbols tells us that something powerful within these stories resonates deep within us. 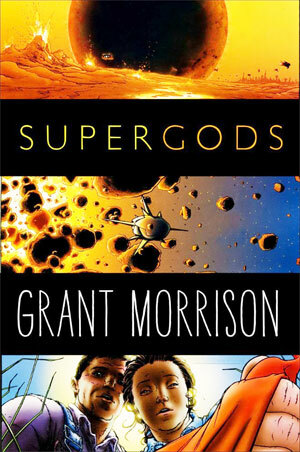 It’s a big question with big answers, and many have tried to answer it, including Grant Morrison in the uneven-but-nonetheless-interesting Supergods. (Quick review: the parts where Morrison tries to explore the concept of the superhero are better than the parts where Morrison tries to explore the concept of how awesome he is.) I’m certainly not the one to provide the last word. But if you pressed me on it – or if I had to write a blog post on the subject to finish up my month of talking on the subject – I’d say that there are five aspects to good superhero stories, five things that light the fire in our blood and make lightning quicken our pulse. Spectacle: Nothing can match the colour, movement and raw kinetic energy of a superhero comic, although a good superhero movie or prose story comes close. It’s a genre of fantastic costumes, giant robots, gods and monsters on downtown streets, universe-in-the-balance battles and casts of thousands that still pick four or five dudes out as being The Ones to Watch. For raw visual captivation, there is truly nothing like it. Possibility: All that spectacle comes into play by offering a world/universe of unlimited possibility, a place where nothing is off limits. Superhero stories can offer up sentient worlds, men made of fire and lightning, battles inside the Id, legions of time-travelling posthumans, subatomic cities of octopus people, dragons, Jesus, I don’t know, everything. Everything. Superhero stories blow the lid off, and when they do it right you never stop to think that there had been a lid there in the first place. Action: There is a place for introspection, discussion and philosophy in a superhero story. That place is after the end of a big-arse action scene, with the explodings and the eyebeams and the robot-on-robot, oh yes. This is a genre of action, which is why Action Comics came first. That doesn’t have to mean fighting and it certainly doesn’t have to mean killing or explicit violence; action can be all ages and still effective. But it’s a genre built on conflict, on striving and on actively overcoming obstacles, and all the visceral thrill that provides. Themes made manifest: Batman is a reaction to madness, and so he fights villains that personify types or aspects of madness. Spider-Man is an animal avatar, and so he fights villains that personify various animals. Wonder Woman is an embodiment of feminine power, so her villains seek to corrupt, capture or question that feminine power in some way, usually in a way that lets her hit them in the face with a bus. Superhero stories take the themes and underlying questions of a premise and make them real entities, so that the moral questions of good and evil or principle versus necessity can be about galactic-scale entities or two people in funny pyjamas, and the conflict becomes real and understandable and immediate. And there’ll be punching. Heroism: And in the end, this is what separates the genre from fantasy, SF, pulp adventure and others – the sense of an underlying moral order to the stories, a world where there is right and wrong. Even when the line between the two is fuzzy, the line is still there somewhere, and stories revolve around the need to defend what is good from what is bad. For some people, that kind of underpinning is simplistic and trite and drives them away. That’s cool. For me, and for many, many others, it makes these stories about something that matters. When superhero stories are badly done, they tend to only focus on spectacle and action, and so everything is a big fight scene full of robots and guns and grimaces and thigh pouches and shouting and oh goddamnit Rob Liefeld just jizzed on my foot. But when they’re done well, when they compress an entire technicolour universe down to two dimensions and 24 pages, when they capture the beauty and excitement of things that cannot be, when they give us something to dream about and maybe even aspire to in some way… well, then those stories are wonderful. In every sense of the world. That’s it for Superhero Month, folks. Have you had fun? It’s been a really interesting exercise for me – a chance to write a variety of lengths/styles of posts on the one topic, speak to something I don’t usually focus on and plain ol’ geek out about how much I love dudes in spandex. It’s also been a disaster as far as getting actual goes-into-a-book-someone-pays-to-read writing, though. I got absolutely nothing done this last month, not a single word on any story or creative project, because every time I had the energy and opportunity to write, I wound up working out a 1000 word essay on why Secret Six was so damn baller. Hang on, wait, I didn’t write that one. Damn. Look, just go read Secret Six already, okay? So anyway, huge fun, worth the time, but not something I can repeat too often, because I need to put some energy back into my fiction. If (when) I do another month-long special on another topic/genre, it’ll be after I put the next book to bed and need to change things up for a few weeks without feeling too guilty about neglecting my Very Important Art. Now if you’ll excuse me, I’m going to spend the rest of the evening reading the playtest files for the Atomic Robo RPG. 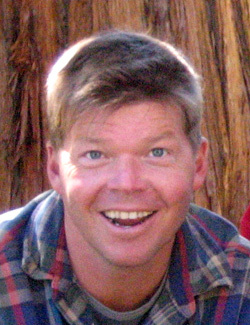 Dude – I want to read the essay on Secret Six. 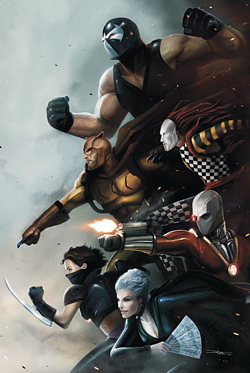 I love Secret Six! Plus I need to go back and read the rest of superhero month, because the bits I have read have been awesome!